Hi friend! I hope you’ve had a splendiferous week! It’s been a little doomy and gloomy here in Kelowna, but I’ve still managed to get out and do some exploring. Yesterday I found a beautiful new beach with the cutest little bird sanctuary right beside it about a 20-minute walk from my house. Once it clears up a little bit I’m going to head back there and take a really thorough look around. Today’s article is designed to help make your life a little bit easier! Between December and August of this year I took 13 different flights (not including connections…. blerg!) plus a few road trips, meaning I was pretty much constantly on the go for about 8 or 9 months. Swap out that extra pair of shoes for your magic bullet and keep some fresh fruit and veggies in your mini fridge along with some travel sized protein powders or hemp hearts to whip up daily smoothies. If you can’t do your green smoothie/juice while you’re gone pack what I like to call my “insurance policy.” This could be individual packets of your favourite protein/greens (I like this one, this one, and this one) or a really potent multivitamin/mineral complex. Bring along a mason jar, pick up a can of coconut milk and whip up my Matcha Maca Latte or Stress Busting Hot Cocoa using hot water from the coffee maker. I relied on these for my brekky when I was in Toronto in May. Research the area to which you’re traveling to find some healthy juice, smoothie, salad bars or organic cafes. Reach out to friends who travel and get their suggestions. Bring some homemade snacks while flying: kale chips, energy balls, homemade trail mixes and granola bars, grassfed & nitrate free jerkies, veggie sticks & dips. 6. Know Who to Turn To! Find a few trustworthy brands of energy bars you can rely on for airport snacks. I like KIND bars and Vega One Bars. I’ve also noticed that many airports (well Pearson International and Minneapolis/St. Paul) have great build your own salad bars, healthy snacks, and even kale chips! 7. Stock Your Carry On! Bring ear plugs, an eye mask, and some of your favourite essential oil with you on long flights so that you can relax and arrive feeling refreshed. I like to bring lavender (for calming), peppermint (for a boost), and a Thieves oil blend in case there are a lot of people coughing (it’s good for the immune system!). Travel can make you feel dry and dull thanks to recirculating air and heaters, so make sure you bring a water bottle and drink up as often as possible. 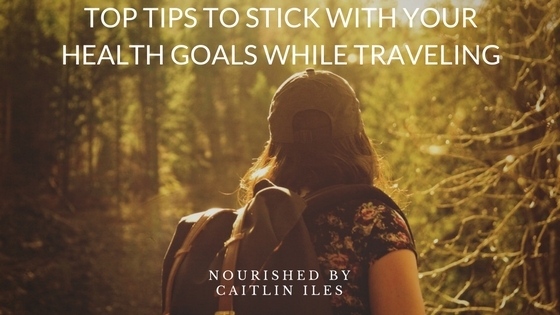 Well those are some of my favourite tips to stay on track while I travel. Make sure you download my FREE Sensational Smoothies E-Book to get some inspiration for hotel smoothies by clicking here!